In July, the OSCC Board of Directors voted to support Measure 103 to keep groceries tax free. Measure 103 would prohibit state and local taxes on groceries. If approved, the measure would permanently block taxes on groceries without specific voter approval. 1. Join the coalition. If your chamber has endorsed Measure 103, please contact Jenny Dresler and we will put you in touch with the campaign. 2. Get the facts. The opposition has been making several outlandish statements about Measure 103. Get the facts from this memo. 3. Create a video. Measure 103 has created three brief script options that you or a chamber member could use to create a 15 second video indicating your support. 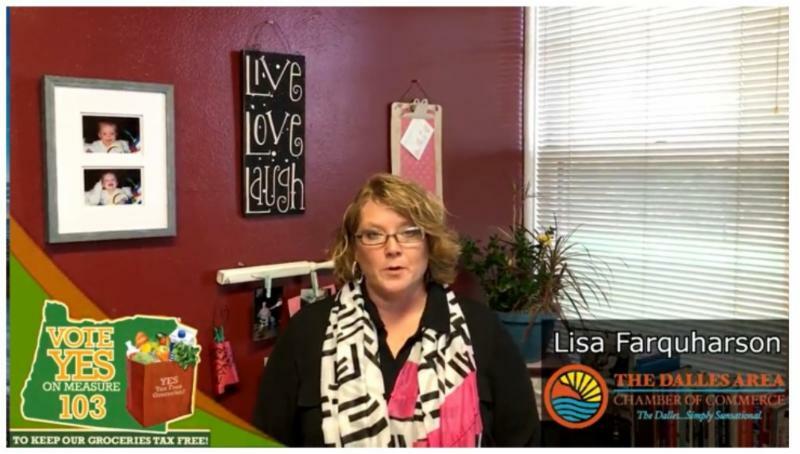 Click here to watch the video by Lisa Farquharson at The Dalles Area Chamber of Commerce. Once you have created the video, follow the submission instructions included with the scripts. Jake Pelroy will be reaching out on behalf of OSCC to provide resources and garner support from local chambers.